Piegan Pass, Glacier National Park. The hike to Piegan Pass is among our favorite Glacier Park hikes, and is very popular for those who love hiking mountainous areas in Glacier National Park. The views the entire way along this well known Glacier Park hike are wonderful, which make this hike in Glacier Park well worth the time and effort. On your way to Piegan Pass, the Piegan Pass Trail in Glacier Park will climb 1,670 vertical feet, which is regarded as an average amount of vertical gain, especially with a mountain pass involved. Piegan Pass itself is 7,560 feet above sea level, which is quite high, thus allowing for terrific views all around. On your Glacier Park hike to Piegan Pass, you will have the choice of either reaching Piegan Pass (4.5 miles one way), and then returning to your vehicle at Siyeh Bend along the Going To The Sun Road, or you can keep going all the way to the Many Glacier Hotel, which is 8.3 miles north of Piegan Pass. If you take this trail to the Many Glacier Hotel, you will lose 2,640 vertical feet in elevation. 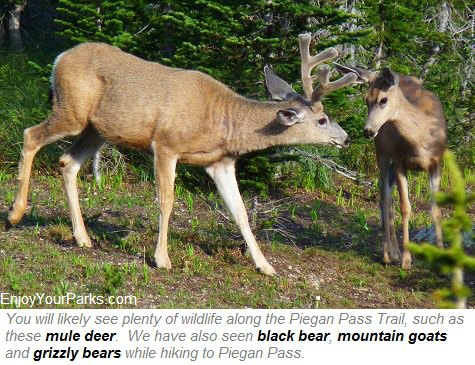 Once you reach Piegan Pass in Glacier Park, there are two additional short excusions you might want to consider. 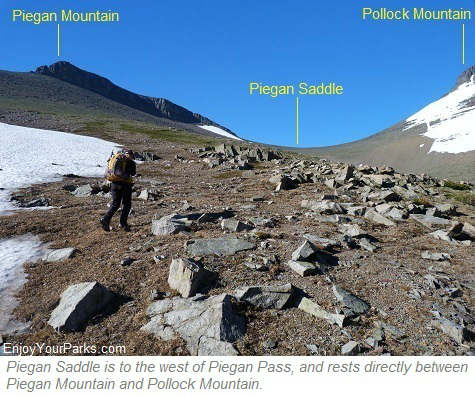 One of these side trips is the hike up to the Piegan Saddle between Piegan Mountain and Pollock Mountain, and the other side trip is the hike up to the Summit of Cataract Mountain. We'll talk about both of these Glacier Park excursions later on this page. 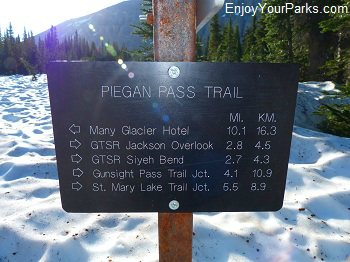 The trailhead to Piegan Pass in Glacier Park is located at the Siyeh Bend on the Going To The Sun Road. 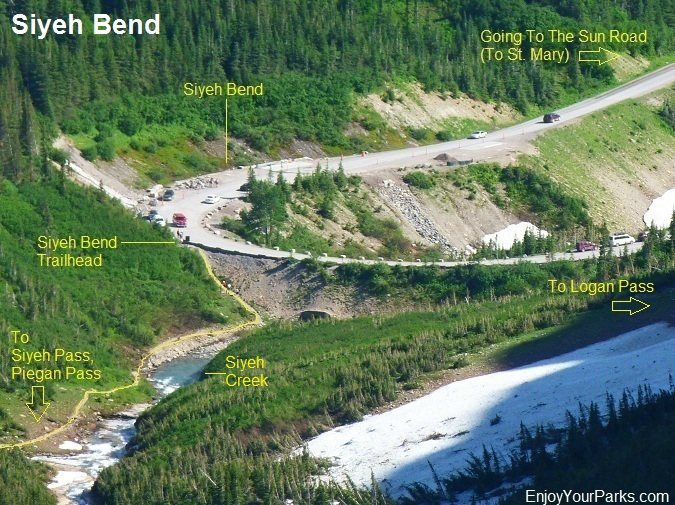 The Siyeh Bend is located on the east side of the Going To The Sun Road, about 3 miles east of Logan Pass. This extremely sharp bend on the Going To The Sun Road has a place to park your car, and there is also a shuttle stop there. The actual trailhead to Piegan Pass is on the north side of the road. Below is a photo of Siyeh Bend in Glacier Park. Siyeh Bend along the Going To The Sun Road in Glacier National Park. The trailhead to Piegan Pass is located here. This is a popular trailhead in Glacier Park because it can take you to both Piegan Pass and Siyeh Pass, which are two very popular Glacier Park hikes. From the Siyeh Bend Trailhead in Glacier Park, the trail to Piegan Pass takes you along the east bank of Siyeh Creek for a few hundred yards, and then the trail takes an abrupt turn to the right (east), up into a fairly dense forest of spruce and fir as the Piegan Pass Trail works its way around the west side of the famous Going To The Sun Mountain. In about 1.2 miles, you will reach the junction with Piegan Pass Trail. STAY LEFT to keep heading to Piegan Pass. The trail to the right will take you to the Jackson Glacier Overlook along the Going To The Sun Road, and it is not where you want to end up. Shannon hiking along the Piegan Pass Trail in Glacier National Park with Piegan Mountain to the west, with Piegan Glacier resting on its east face. 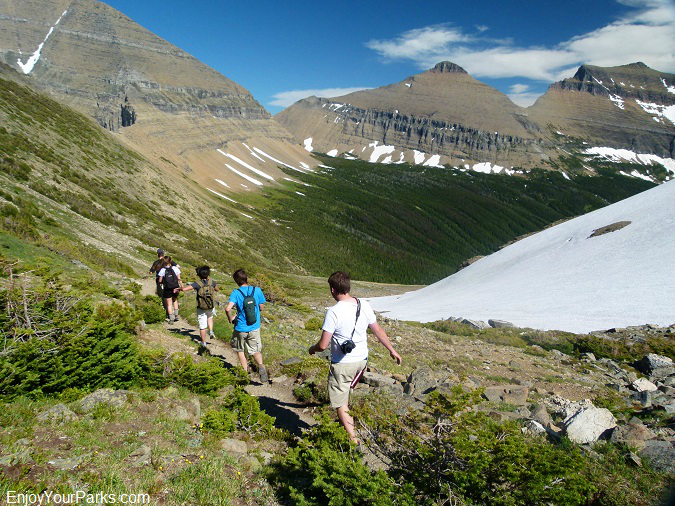 The hike to Piegan Pass is among our favorite Glacier Park hikes. Once you reach this junction, the trail to Piegan Pass in Glacier Park turns northward as it works its way below the gigantic cliffs of the west side of Going To The Mountain. These huge cliffs will tower over you to the right (east) and to the left (west) towers the amazing Piegan Mountain. 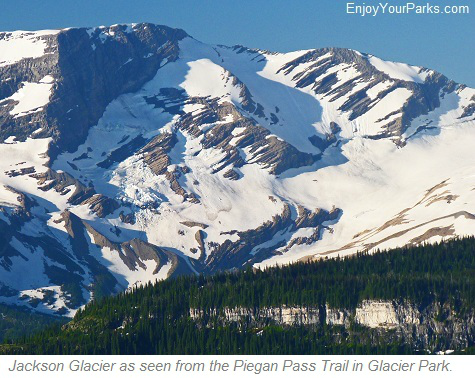 The further you hike northward along this Glacier Park trail, the more Piegan Glacier begins to show itself. 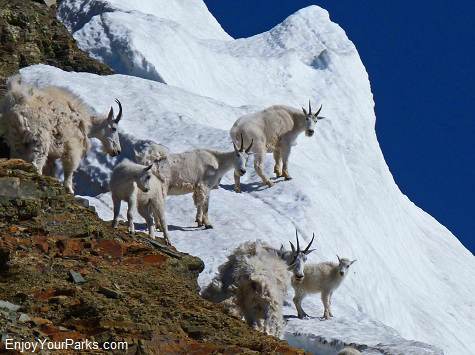 Piegan Glacier rests on the east face of Piegan Mountain, and it is quite a site to behold. 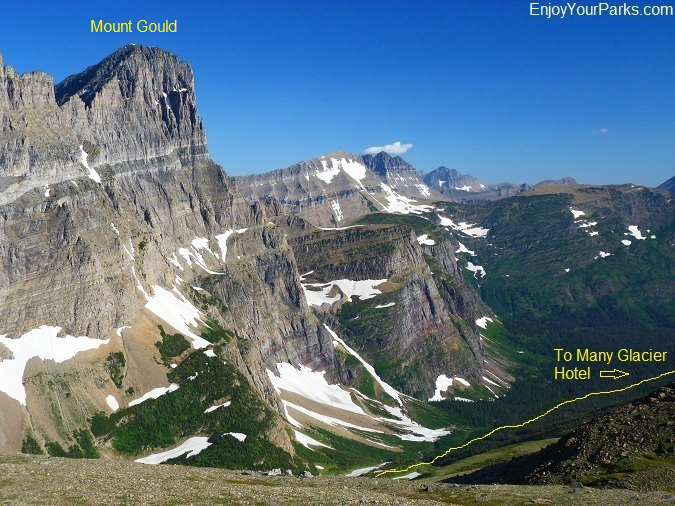 As you continue your Glacier Park hike northward to Piegan Pass, with Going To The Sun Mountain and Matahpi Peak looming above you to the east (right), and with Piegan Mountain and Piegan Glacier to your west (left), you will encounter another trail junction. This is the junction with the Siyeh Pass Trail, and is where hikers heading for Siyeh Pass will turn right. To continue onward to Piegan Pass, you need to keep going straight (north). In other words, STAY LEFT to keep heading towards Piegan Pass in Glacier Park. The junction with Siyeh Pass Trail is located at the beginning of what is known as Preston Park. This lush area is known for its wildflowers and dwarfed fir trees. The Siyeh Pass Trail, which takes you to Siyeh Pass, heads right up the middle of Preston Park as it works its way northeast. This is a view of the Piegan Pass Trail from the summit of Piegan Mountain in Glacier Park. This trail gives you the option of two popular Glacier Park hikes, one being the hike to Siyeh Pass and the other being the hike to Piegan Pass. Both of these Glacier Park hikes are outstanding and we highly recommend them. Your Glacier Park hike to Piegan Pass continues northward from this junction, and you will begin to see the monstrous Mount Siyeh to the northeast. 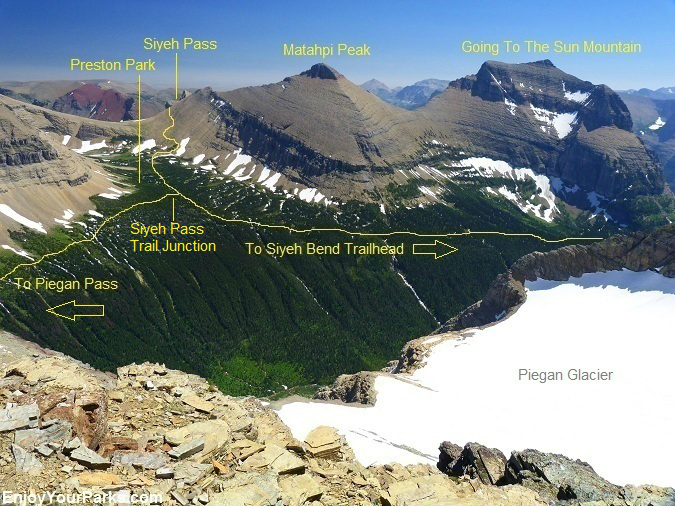 At 10,14 feet, Mount Siyeh is one of the six mountains in Glacier Park that exceed 10,000 feet, and are known as "The Big Six". 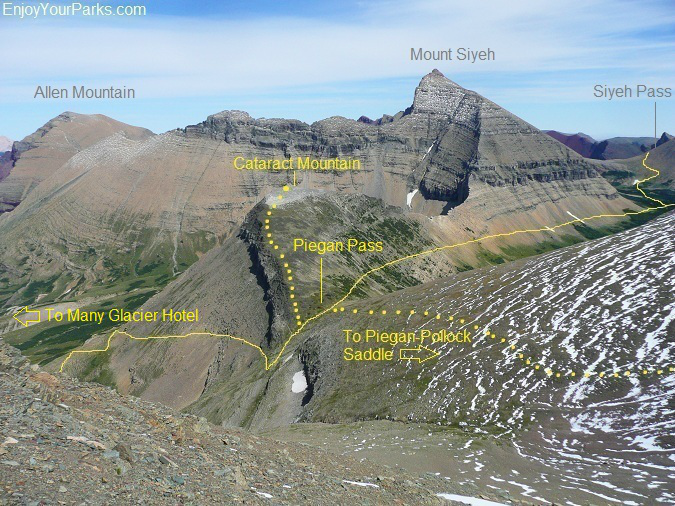 The trail to Piegan Pass will reach the west buttress of Mount Siyeh, and then turn to the west, following the south slope of this long buttress as you begin to climb a little more abruptly in elevation. You are now on the final stretch to Piegan Pass in Glacier Park, and we feel this is the most scenic part of the hike as the trail climbs in elevation. The view to the south is magnificent, with the Blackfoot Glacier - Jackson Glacier Complex emerging into view to the far south. Piegan Mountain and Piegan Glacier dominates the view to the southwest, and Matahpi Peak and Going To The Sun Mountain dominates the view across the valley to the south east. Your view to the north is completely blocked by the west buttress of Mount Siyeh, but you will get to see Cataract Mountain, which is the highest sharp point along this long buttress directly above you to the north. Along the final stretch of the Glacier Park hike to Piegan Pass, you will get a great view of the Blackfoot Glacier - Jackson Glacier Complex to the south. This is one of the largest glacial complexes in Glacier Park. This is a view looking south from the final stretch of the Glacier Park hike to Piegan Pass. From this vantage point you can see where your vehicle is park at Siyeh Bend. 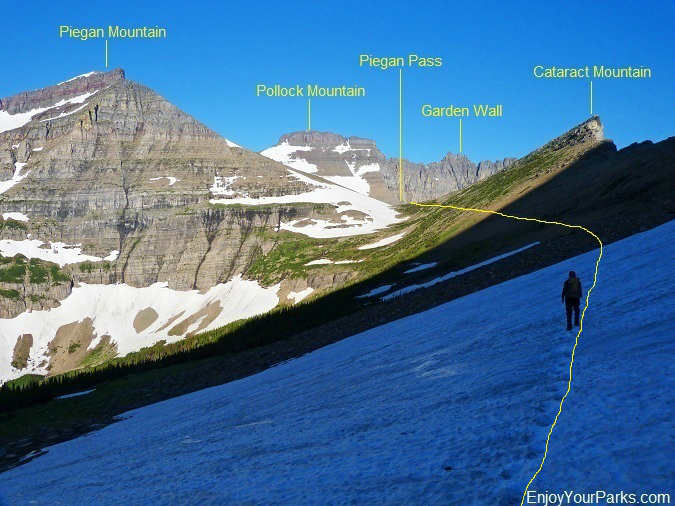 As the trail to Piegan Pass in Glacier Park continues to gain in elevation as it heads westward along the south slope of the buttress, you will begin to see the Garden Wall emerge directly in front of you to the west. You will also get a great view of Pollock Mountain that is located just to the north of Piegan Mountain. By the way, there is a saddle between these two huge glacier park mountains called the Piegan Saddle that you can hike to once you get to Piegan Pass. As the Piegan Pass Trail works its way along the west buttress of Mount Siyeh, you will see the famous Garden Wall begin to emerge behind Piegan Pass. You will also get a view of Piegan Mountain, Pollock Mountain and Cataract Mountain. By the way, be careful hiking on the snow fields early in the season on this popular Glacier Park hike (this photo was taken on July 30th). This open slope often has snow fields on it early in the season, so be prepared for this. We recommend that you use traction devices on your boots, such as YakTrax or something similar, especially if the snow fields are icy early in the morning. Snow fields can be really dangerous, so be really careful. 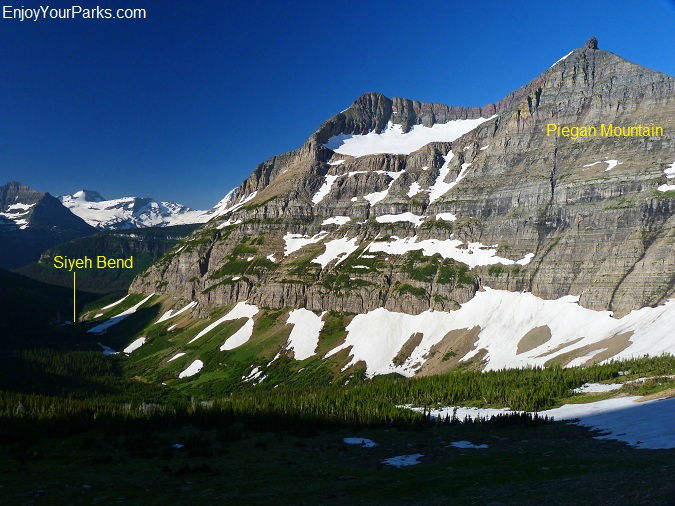 This is the classic view of the Garden Wall and Mount Gould from Piegan Pass in Glacier Park. The camera is facing northwest. 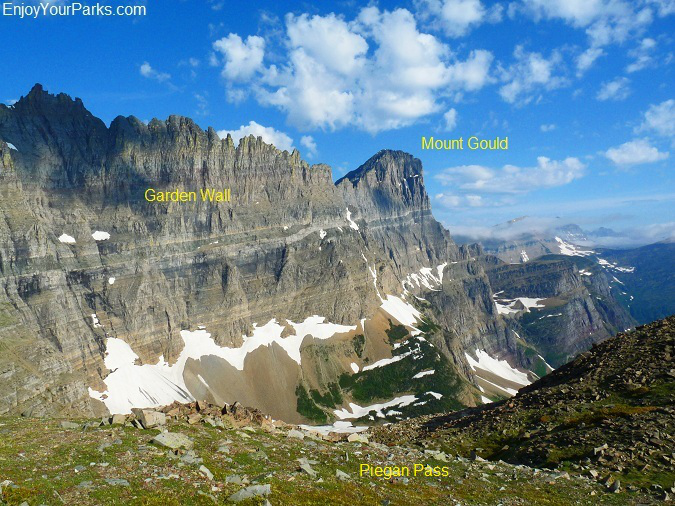 As you reach Piegan Pass (elevation 7,560 feet) during this wonderful Glacier Park hike, the Garden Wall becomes a breathtaking sight that dominates the view to the northwest. To the southwest, you will see the broad alpine slopes that make up the Piegan Saddle that is situated between Piegan Mountain and Pollock Mountain. The Garden Wall is attached to the north side of Pollock Mountain, and as this great wall heads northward, it eventually connects with the iconic Mount Gould, which is the major feature in the distance to the north, looming above Cataract Creek Valley. This large valley is where the Piegan Pass Trail continues onward until it eventually reaches the historic Many Glacier Hotel to the north, which is located out of view at the far end of this Cataract Creek drainage. This is a view of the Garden Wall from Piegan Pass in Glacier Park. 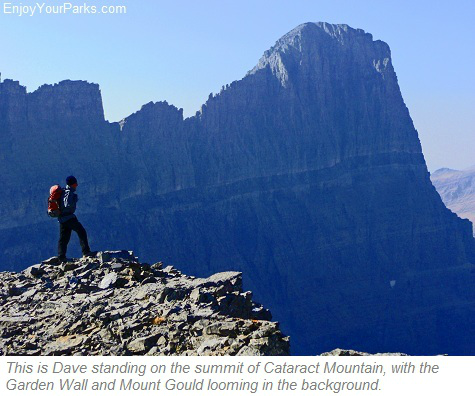 This giant wall rests between Pollock Mountain and Mount Gould, and is a famous Glacier Park landmark. By the way, if you could drill a tunnel directly through this great wall, you'd reach the Highline Trail on the other side! When you look back to where you just came from (to the east), you will see Mount Siyeh towering above the landscape to the northeast, as well as Matahpi Peak to the east and Going To The Sun Mountain to the southeast. Piegan Pass itself is surrounded by a classic alpine landscape, and during certain times of the summer can be home to many gorgeous wildflowers. This is a view to the east from Piegan Pass in Glacier Park. 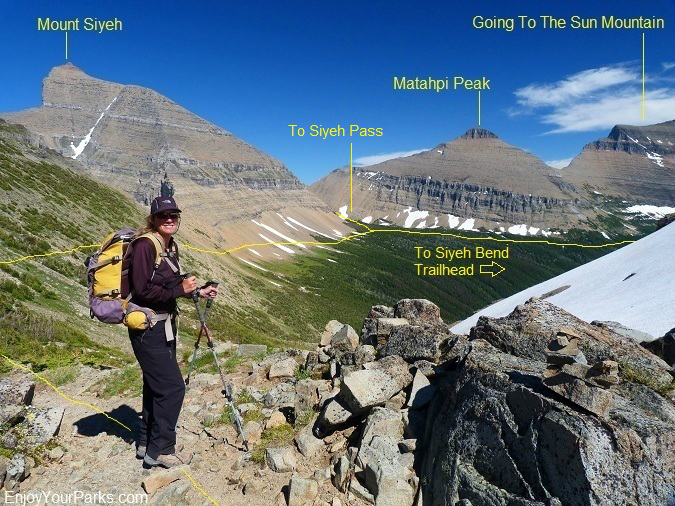 As you can see, you will have great views of Mount Siyeh, Matahpi Peak and Going To The Sun Mountain on this popular Glacier Park hike. If you're feeling adventurous, there is a primitive climber's trail that starts at Piegan Pass and works its way up alpine slopes to Piegan Saddle, which is directly above Piegan Pass to the southwest and is approximately 900 vertical feet higher in elevation than Piegan Pass. The Piegan Saddle sits directly between Piegan Mountain to the south and Pollock Mountain to the north. This hike is quite steep because you're covering 900 vertical feet in less than a mile, so make sure you're in adequate physical condition before you attempt this additional hike. 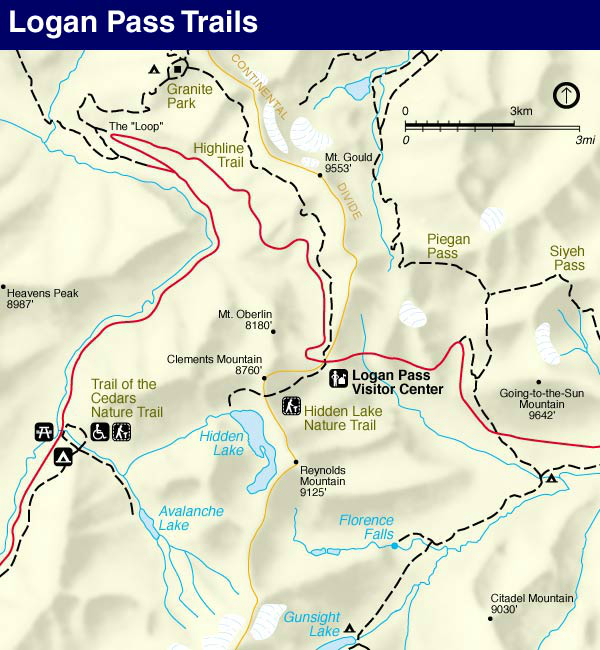 The trail leaves the Piegan Pass Trail right from the pass, and heads up the alpine slopes to the south. The view from Piegan Saddle in Glacier Park is absolutely magnificent! This is a view to the southwest from Piegan Saddle, towards the Logan Pass Area of Glacier National Park. 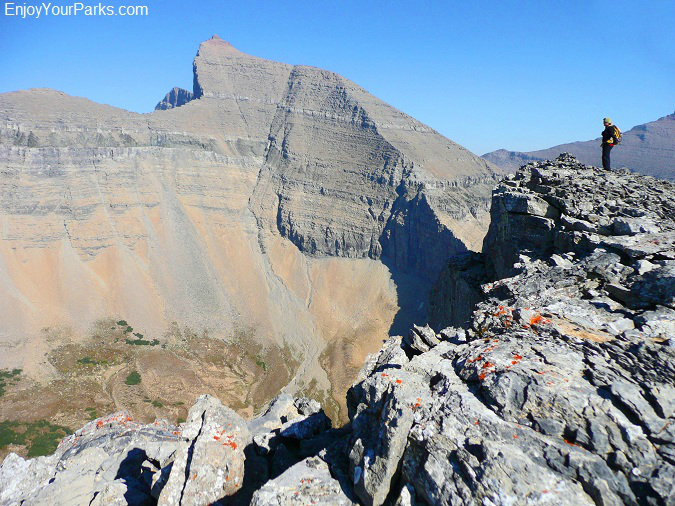 For those of you who actually take this Glacier Park hike to Piegan Saddle (aka Piegan-Pollock Saddle), you will be greatly rewarded by an absolutely spectacular view of the Logan Pass Area to the southwest. This view is world class, and you be thousands of feet above the valley floor to the southwest. Your view to the southwest from the Piegan Saddle includes Logan Pass, Bearhat Mountain, Reynolds Mountain, Mount Jackson, Mount Edwards, Gunsight Mountain, and much more. The drainage directly below you ends up at Lunch Creek Turnout on the Going To The Sun Road. From the Piegan Saddle, looking back towards the Piegan Pass Area to the north is equally rewarding. The view of Cataract Mountain and Mount Siyeh is incredible. Pollock Mountain dominates the view to the north. 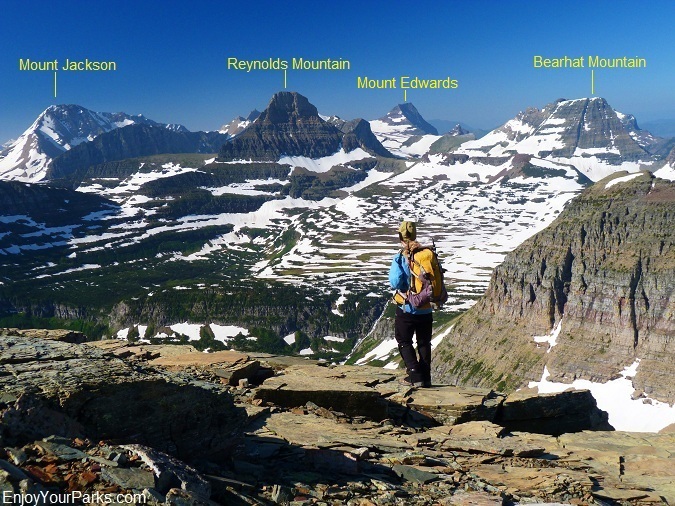 If you're up for it, this world class view of Glacier National Park is relatively easy to reach. 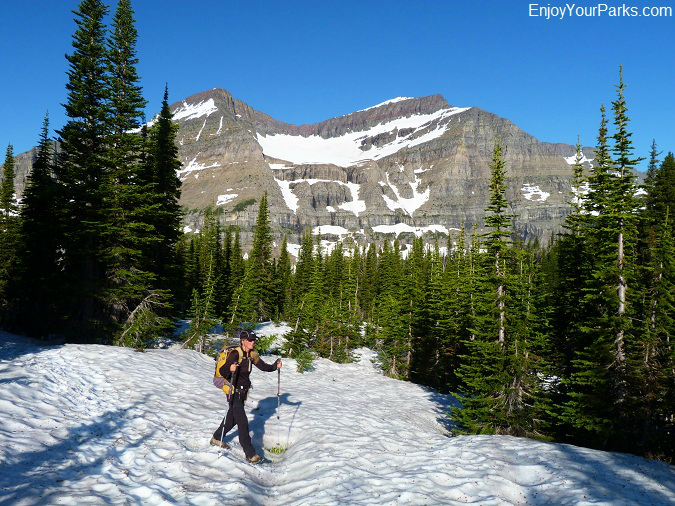 It's really a special place in Glacier Park that is usually only visited by the occasional climber on his/her way to climb Piegan Mountain or Pollock Mountain, and we are quite confident you will be thrilled at what you see. Oh and by the way, the wind might be horrific on the Piegan Saddle, so make sure you bring proper wind gear or you will be miserable up there and your time on the saddle will be cut short. Once you reach Piegan Pass in Glacier National Park, you also have the option of actually hiking to the summit of Cataract Mountain (elevation 8,180). There is not a trail to follow, but it's quite easy to know where to go. At Piegan Pass, there will be a rocky ridge of black rock that heads to the northeast. This ridge takes you directly to the summit of Cataract Mountain. This is nothing more than a scramble with no climbing involved, but you need to be careful not to sprain an ankle while walking on top of the large rocks piled along this ridge walk. And you also need to be in at least decent physical condition before attemping this Glacier Park hike because you will be climbing about 700 vertical feet in less than a mile. This is a view of the monstrous Mount Siyeh from the summit of Cataract Mountain. The ledge just in front of Shannon, which is the north face of Cataract Mountain, is a 1,900 foot straight up and down cliff. The first thing that you'll notice once you hike to the summit of Cataract Mountain is the amazing north face. This face is about 1,900 vertical feet straight down, and it really quite a sight to see. This impressive wall lies at the head of Cataract Creek, and the Cataract Creek Valley to the north. The view of this country from Cataract Mountain is quite breathtaking. And after climbing over 70 mountains in Glacier National Park, we have developed a huge respect for these abrupt edges. We have been standing on a mountain peak in such calm air you could literally light a candle, and in less than an instant, a gust of wind will come out of nowhere and throw us off balance. So take this advice from someone who's experienced... respect the edges, even if it's a calm day! This is a view of Piegan Pass from Piegan Saddle in Glacier Park. 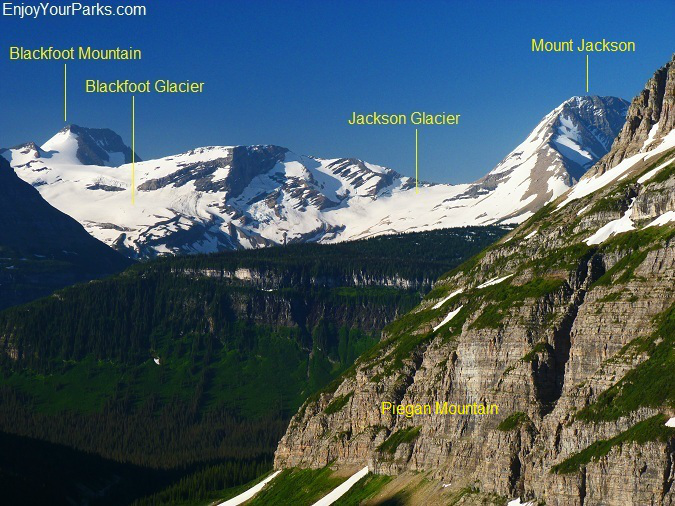 This shows the routes to Cataract Mountain and Piegan Saddle from Piegan Pass, which are optional off-trail Glacier Park hikes. Once you enjoy your time on Piegan Pass in Glacier Park and have a nice lunch break, then you can begin hiking back to your vehicle parked at Siyeh Bend (which is 4.5 miles from Piegan Pass), or you can keep going along the Piegan Pass Trail and end up at the Many Glacier Hotel which is about 8.3 miles north of Piegan Pass, and is 2,640 vertical feet lower than Piegan Pass. This is a view of the Piegan Pass Area from the summit of Piegan Mountain. The camera is facing straight north. This is a great vantage point to see the Cataract Creek Valley that the Piegan Pass Trail will work its way down to eventually end at the Many Glacier Hotel parking lot, 8.3 miles from Piegan Pass. If you're goal is to hike to Many Glacier Hotel, then obviously some prior planning must be involved. If you only have one vehicle, we feel the best way to handle this is to leave your car at the Many Glacier Hotel parking lot, and take the earliest scheduled East Side Shuttle Service to St. Mary Visitor Center. Then catch a ride on a Glacier Park Shuttle up the Going To The Sun Road and jump off at the Siyeh Bend shuttle stop. 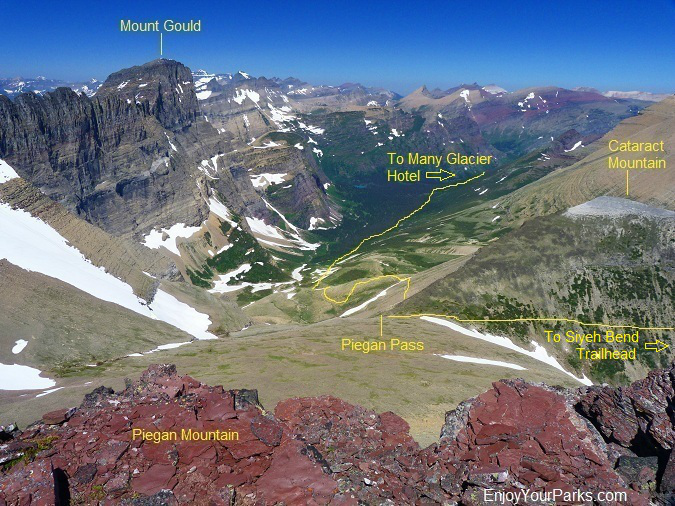 There you can begin your Glacier Park hike to Piegan Pass and end up at the Many Glacier Hotel. Here's another shot of the Cataract Creek Valley from Piegan Pass. 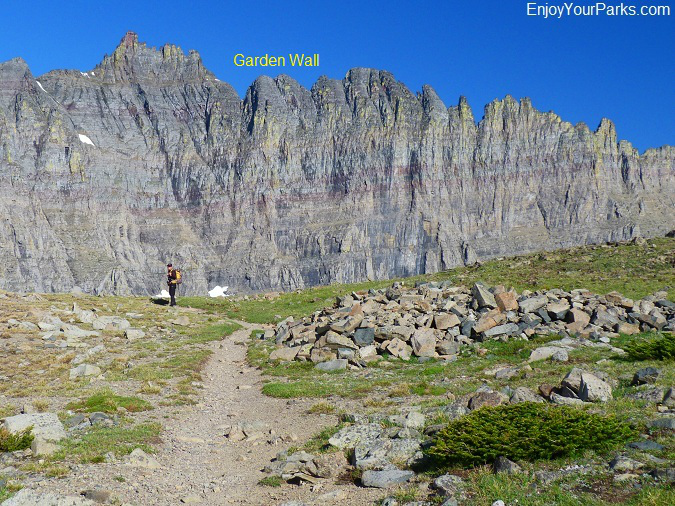 The Garden Wall and the great east face of Mount Gould tower over the Piegan Pass Trail to the west as you work your way to the Many Glacier Hotel parking lot. The hike down to the Many Glacier Hotel is quite nice. You will hike down the Cataract Creek Valley, with the Garden Wall and the great east face of Mount Gould towering over you to the left (west) and Allen Mountain to your right (east). You will cross Cataract Creek twice, and you will have the opportunity to see both Morning Eagle Falls and Feather Plume Falls along the way. Once you get to the end of this valley, you can either continue on the Piegan Pass Trail all the way to the Many Glacier Hotel, or you can take the cut off trail to Grinnell Lake and follow the trail along the South Shore Lake Josephine Trail and Swiftcurrent Lake Nature Trail if you want to avoid a heavily used horse trail. Either way you'll end up at the Many Glacier Hotel parking lot. The hike to Piegan Pass is one of our favorite Glacier Park hikes, and once you take this hike to Piegan Pass, you'll definitely see why. And if you're up for it, make sure to check out the Piegan Saddle or the summit of Cataract Mountain to make your day on Piegan Pass in Glacier Park even more memorable. A group of hikers heading back to their vehicle at Siyeh Bend after a great day on Piegan Pass in Glacier Park. 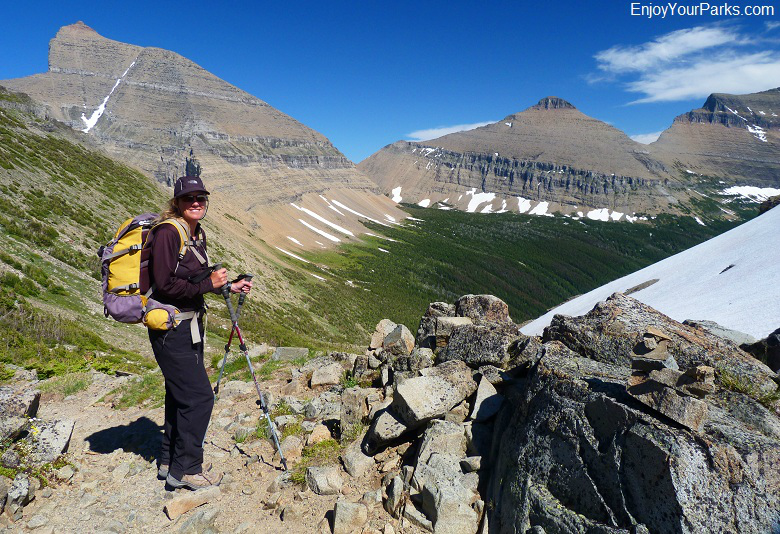 Piegan Pass is an extremely popular Glacier Park hike and is enjoyed by all who take it.